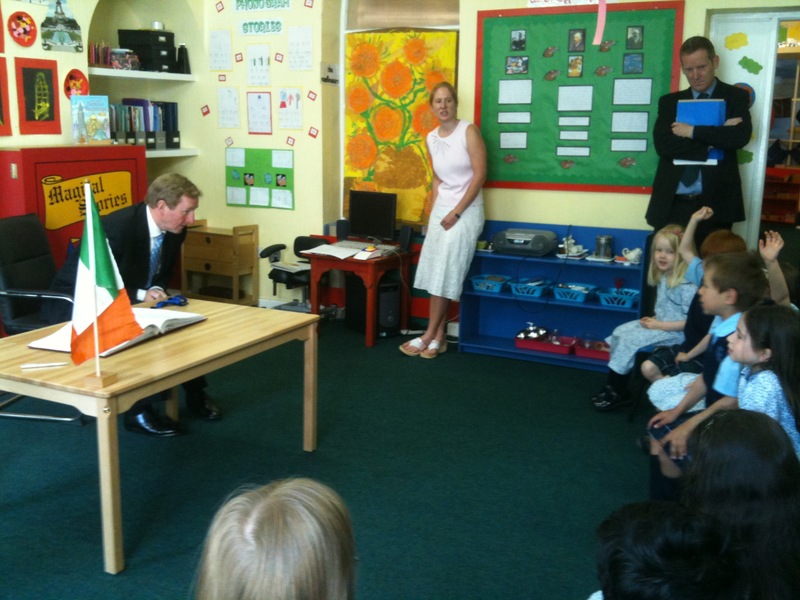 Enda seated at his special An Taoiseach Table. It’s been an eventful season of dignitary spotting thus far for Hedley Park students, from waving at Queen Elizabeth II, and waiting for President Obama. This week was without doubt the highlight with an event that had the big school engulfed in excitement. 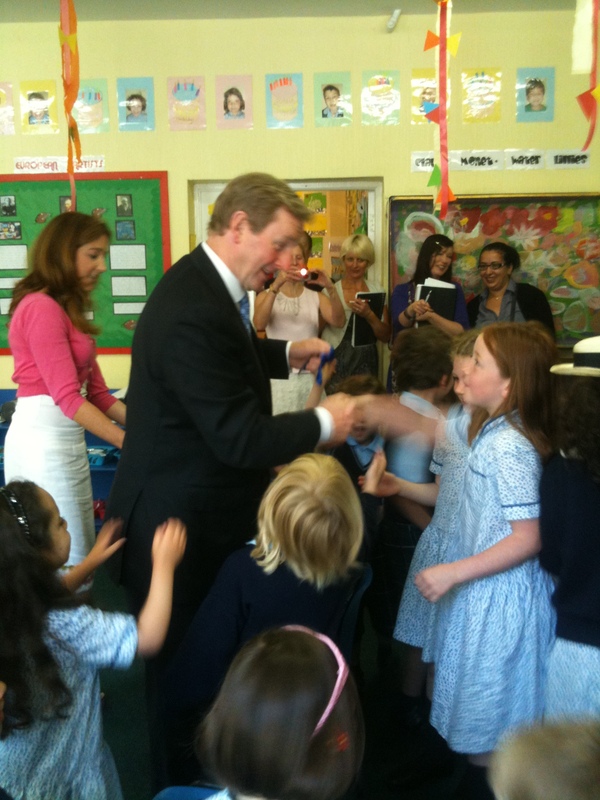 Greeted by Aoibh (whose birthday it was that day) and Felix, An Taoiseach was warmly welcomed by the children and parents. 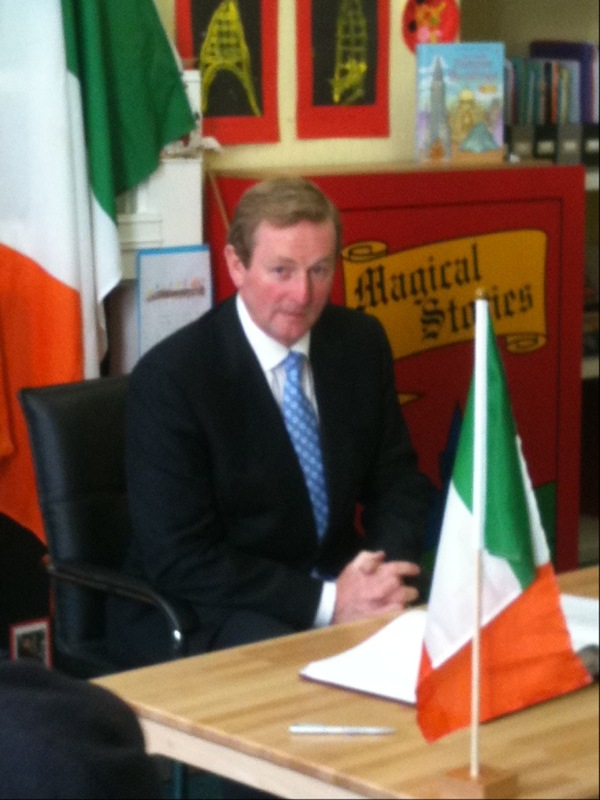 We had prepared well for the occasion and decorated Senior Infants classroom with the flags of Ireland and Co Mayo, just so Enda would feel at home. We had also made a Hedley Park “Badge of Honour” which was presented to him by Elsa and Tristan, Mr Kenny was delighted with the gift and told us he’d hang it in his office. 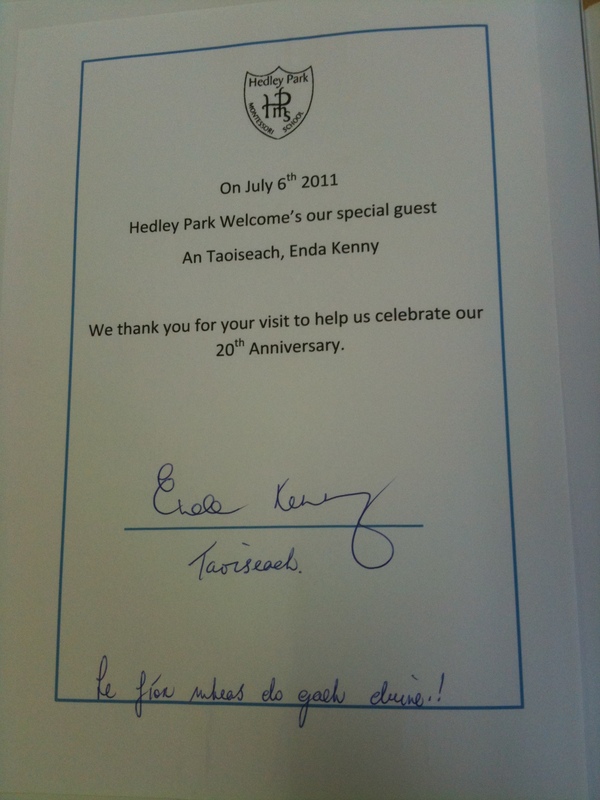 He also gave us something to mark the occasion and signed our 20th Anniversary guest book. The children afterwards took the time to immortalize the day with their drawings of our honourable guest for the book. Two of my favourite questions were “Have you ever been to India, and would you visit my grandparents if you go”? (from Amlan in Junior Infants) and “Have you ever been to Lego Camp?” (from Cian in the nursery) Its thought that two bookings have already been made by the Department of the Taoiseach on these recommendations. 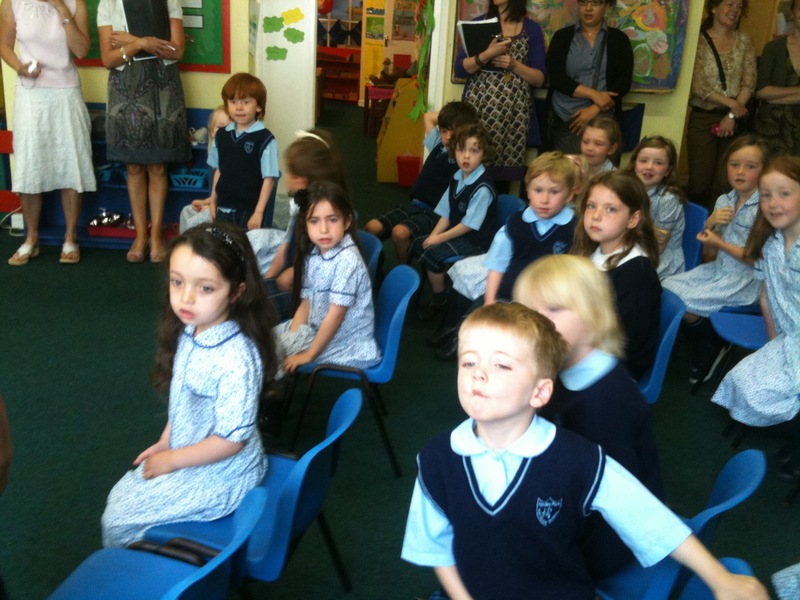 The children of Junior Infants provided a very entertaining musical interlude, which was much enjoyed by all, students, parents, teachers and of course the venerable guest. 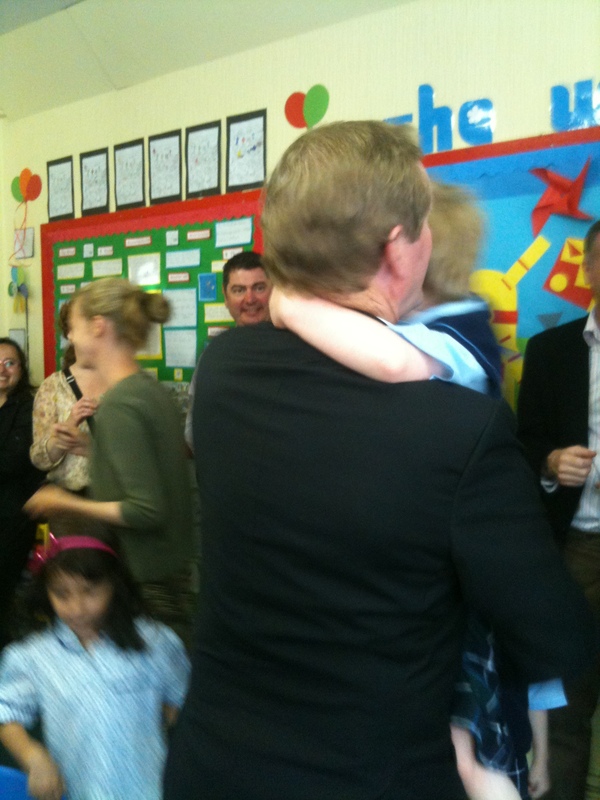 Having detained Enda from his important government business long enough he said goodbye with a flurry of handshakes (big and small) and a special An Taoiseach Snug from Richard. We are sure we made a lasting impression and I know we will all remember the day we had An Taoiseach to visit. Here’s a little gallery of the best of the day, and a sample of the children’s commemorative drawings.